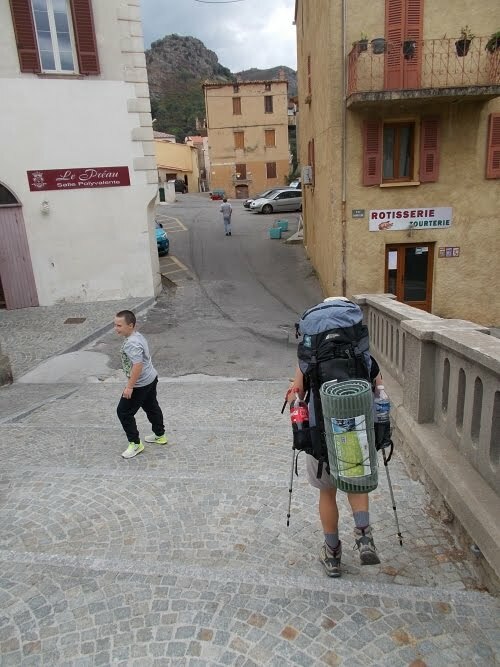 Another Long Walk: Day 1: The Start of the GR 20! September 11: The night at the train station was uneventful. By around 5:30 in the morning, passengers started showing up--somewhat to my surprise. My train wasn't supposed to leave until about 10:00 and I hadn't realized that there would be earlier trains to who knows where. With the arrival of others, trying to sleep behind the back of the station became an effort in futility and I got up. 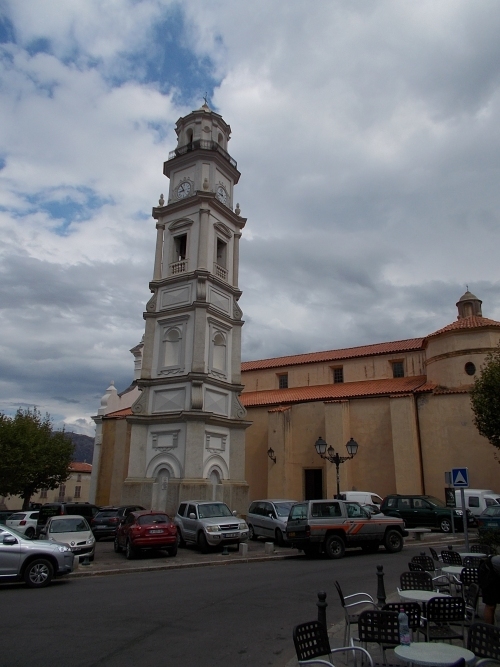 The church tower in Calenzana, where we started our hike of the GR 20! Eventually, I went into the train station now that it was opened and purchased a ticket to Calvi, then killed time mostly reading my Kindle until the train finally arrived and jumped on, quickly grabbing a window seat so I could watch the scenery go by. It would be my first good look at Corsica! Nearby three hours later, I arrived in Calvi at 12:47 in the afternoon, right on time. I hoped Karolina would be waiting at the train station for me because if she wasn't there, I wasn't sure where to look for her or how I might contact her, and even before the train stopped I saw her through my window watching the train pass by. Yes! That was easy! No messing around all afternoon trying to find each other! I got off the train and reunited for our next big trip. The big news she wanted to share with me was that she had just had two wisdom teeth removed a few days earlier and that she was taking antibiotics for it and her mouth hurt, so I was under strict orders not to make her laugh. It hurt to laugh. "What?!" I exclaimed. I didn't mind her having her wisdom teeth recently removed--although I was surprised she had scheduled it so close to the trip. "I can't make you laugh? That's like asking me to leave behind a vital body part! Making you laugh is my only skill! You can't take that away from me! It's not fair!" She cracked a small smile, although clearly she was struggling not to. "Don't make me laugh!" 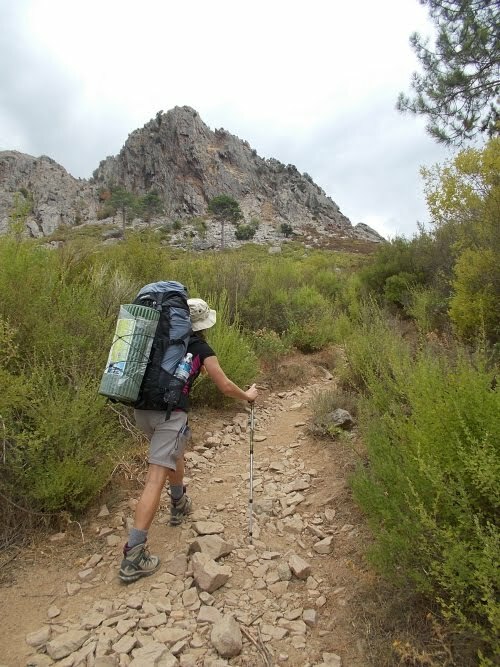 She told me that there was some sort of unexpected dental issue--the nitty gritty details I didn't get--and the wisdom teeth extraction was a very last-minute thing, and she was afraid that it would derail her GR 20 hike. She didn't tell me about it ahead of time because she didn't want me worrying about it if it turned out she could make it anyhow. 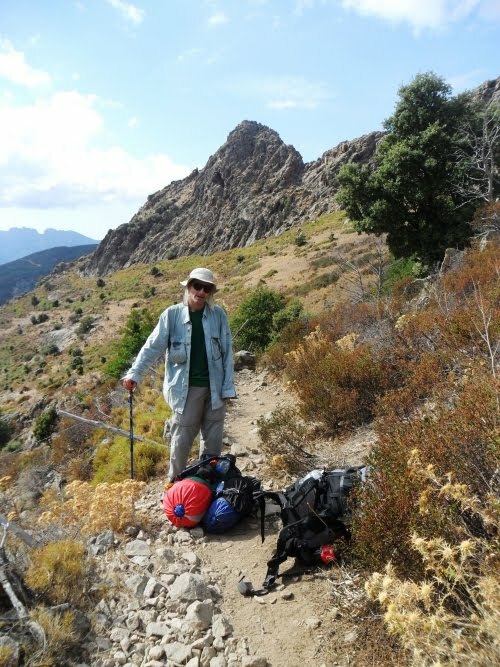 She got official approval from her dentist to hike the GR 20, but to get off the trail and get treatment immediately if it became infected or any other problem developed. There was a certain irony in it for me. I had had two wisdom teeth extracted about two weeks before I started my PCT thru-hike. At least I got mine done a couple of weeks earlier, although I could still clearly feel the two gaping holes in my gums where the teeth once belonged. It wasn't fully healed when I started my hike, so we spent a little time comparing notes on our wisdom teeth extractions. But we had a trail to hike! Karolina had done some research beforehand and figured out that we could take a bus to Calenzana (and the start of the GR 20) or a taxi. The taxi was more expensive (although we'd be able to split the cost two ways which helps), but it was faster and there was no waiting involved. Given that it was already early in the afternoon, we decided on the taxi. We needed to get some miles in today and the day was already getting late! Before we left town, we hit a small grocery store to buy a few odds and ends. I got a sandwich, a banana and a Coke for a quick lunch, and we picked up denatured alcohol for our cooking needs. Karolina and I navigate through the streets of Calenzana. 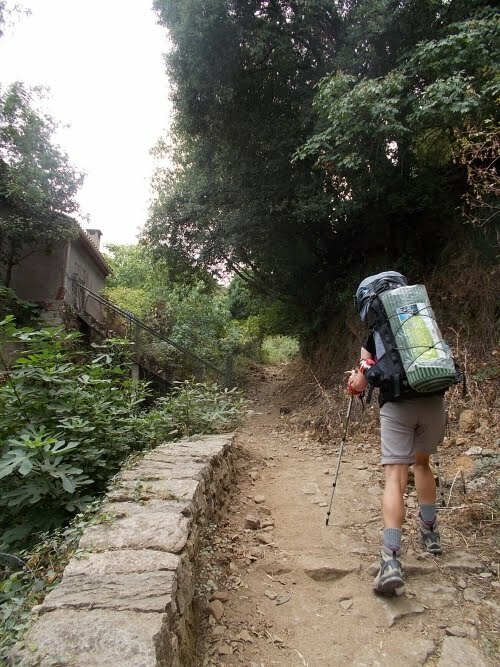 We were dropped off at a large church, took a few starting photos, then followed GR 20 signs through the streets of Calenzana a short ways until the trail left town and started a steady climb upwards into the rugged mountains. 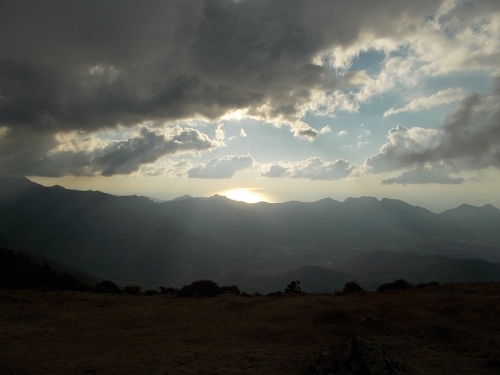 And we caught up on our adventures in Corsica to date. I told her about my late arrival at the airport and the lack of information desk clerks that spoke English, and my night at the slightly sketchy train station. 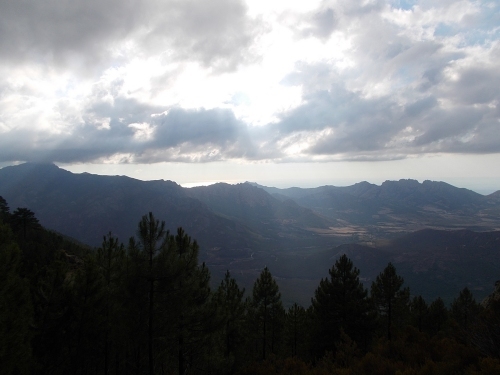 She told me of her night at a campground just at the edge of Calvi, practically a stone's throw from the Mediterranean. We couldn't have been hiking for more than a half hour when a few sprinkles started to fall. Just the lightest of sprinkles, but it was enough that Karolina stopped to pull out her pack's rain cover. Except.... it didn't fit with her sleeping pad under it, and she started walking up the trail just carrying her pad. It looked awkward, though, and when the rain didn't materialize, she put away the rain cover. I carried two pedometers, and lent Karolina one of them so she could track her own steps on the trail. Not 15 minutes went by, however, when she put her hand in her pocket to pull it out and found nothing but a hole her pocket. "You lost the pedometer in a mere 15 minutes?!" I said, surprised. "I carried it 2,200 miles on the Appalachian Trail, 800 miles on the Arizona Trail, the Tour Mont Blanc.... and you lost it in fifteen minutes?!" At the edge of Calenzana, leaving town! It was actually kind of funny. Knowing it had been lost so recently, though, I went back down the trail to look for it. It couldn't have gone far! I never did find it, though, and eventually gave up and returned to where Karolina was waiting. 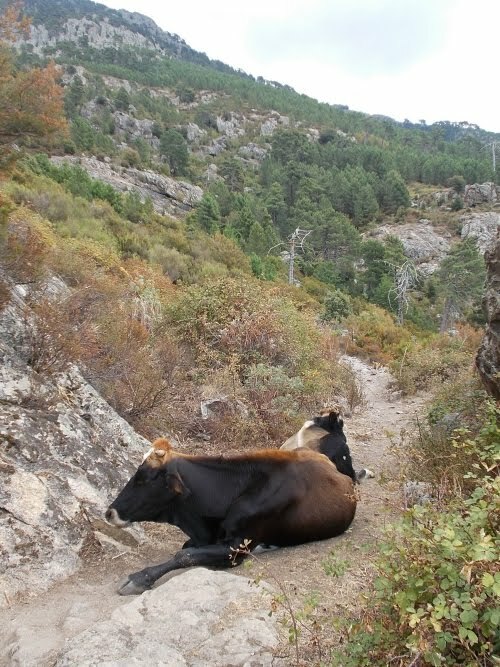 Our first major obstacle on the trail, however, was cattle. There were a couple of large ones laying down right on the trail. I have rule about animals on the trail: Anything bigger than me always get the right-of-way. Karolina and I picked our way through the brush, well away from the cattle on the trail where we found... more cattle. Argh! The views grew progressively better the higher the trail climbed. 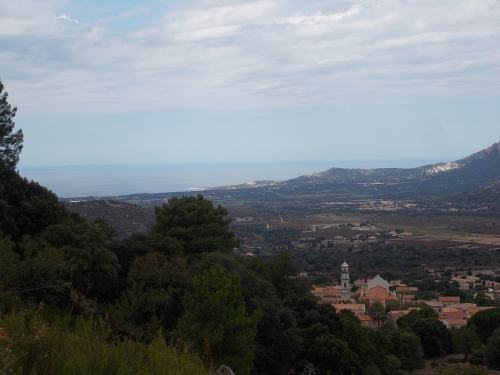 Behind us we could see the Mediterranean Sea spread out across the horizon, and Calvi along the coast, and even the church tower of Calenzana where we started our hike. Ahead, the mountains grew larger and rockier. Beautiful, but difficult. Looking back, you could see the sweeping views of the Mediterranean Sea and even the church tower where we started in Calenzana. Dusk quickly approached, and it was time to start thinking about setting up camp. We didn't have a snowball's chance in hell of reaching the first refuge on the trail, still miles away. Technically, the only legal campsites along this trail are near the refuges, but we had started far too late in the day to reach it. We would have to set up camp before then, and hopefully not get busted. Looking out our guidebooks and topo maps, we decided to stop on a small ridge known as Bocca a u Saltu. I decided to cowboy camp, but quickly threw my tarp over me like a blanket when condensation started forming. 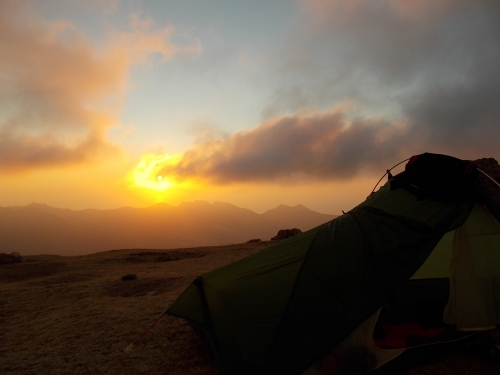 Karolina set up her tent and dived inside soon after sunset. I didn't cook any dinner, but only because I didn't have enough water. We weren't camped near any and I hadn't carried enough to our campsite. I'd be eating dry snacks for dinner instead. 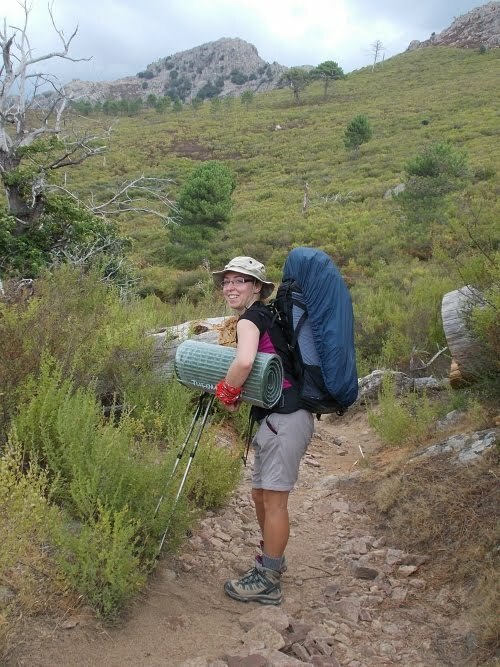 Karolina couldn't fit her sleeping pad under her pack cover, so she started carrying it for awhile. That's not a good long-term solution, however! Karolina's a tree hugger! We were both very impressed with the sheer size of this tree. 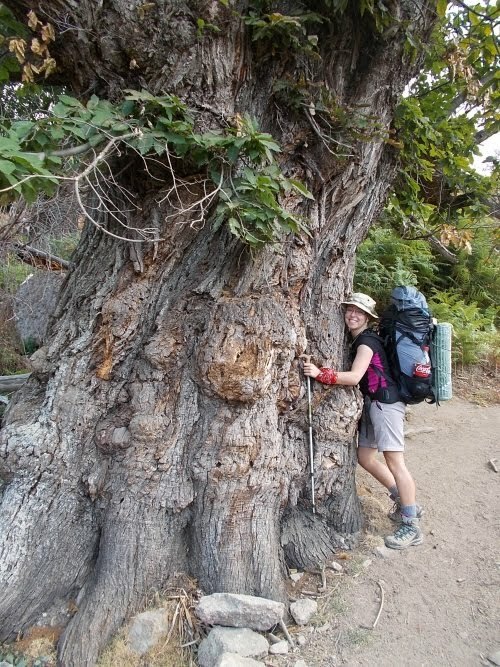 Neither of us had any idea that such massive trees grew in Corsica! Our first major obstacle along the trail.... Mooo! Krowa! 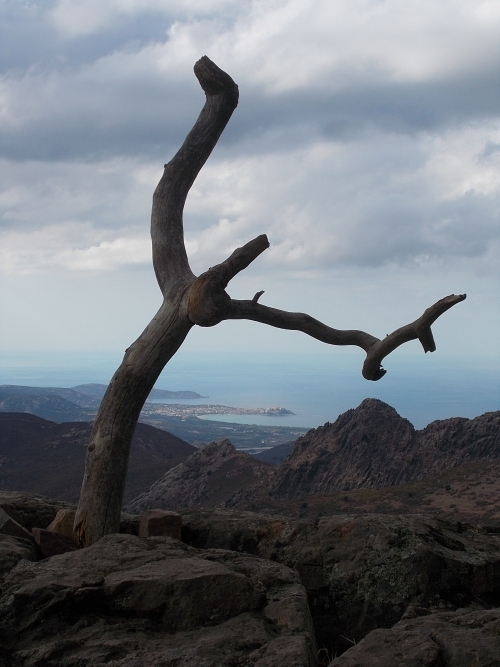 That's Calvi along the coast, where Karolina spent the previous night and were I met her at the train station. As dusk approached, it became imperative that we find a place to camp! 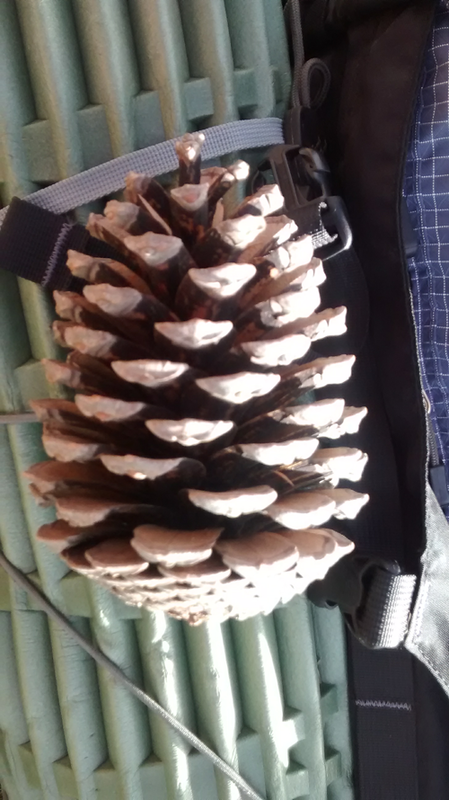 I didn't schedule the extraction of my wisdom tooth just before setting off to Corsica, it was an emergency surgery... And regarding Wilson, my friends over here also think he's an exceptionally big pine cone! No worries.... I did say it was an unexpected thing! Before I realized that, I thought it was strange to "schedule" it so close to the hike--that's what I was referring to. You cleared that up quickly, but I guess I didn't make that clear enough in the blog.